Does it make sense to speak of a European society, above and beyond its component states and regions? In this major new book William Outhwaite argues that it does. He goes beyond the study of individual states and specific regions of Europe to examine the changing contours of the continent as a whole, at a time when Europe is beginning to look and act more like a single entity. In what we have come to call Europe there developed distinctive forms of political, economic, and more broadly social organisation – many of course building on elements drawn from more advanced civilisations elsewhere in the world. During the centuries of European dominance these forms were often exported to other world regions, where the export versions often surpassed the original ones. In the present century many features of European life remain distinctive: the European welfare or social model, a substantially secularised culture, and particular forms of democratic politics and of the relations between politics and the economy. This book provides a concise overview and analysis of these features which continue to make Europe a relatively distinctive region of global modernity. The book will become a key text for students taking courses on contemporary Europe, whether these are in departments of politics, sociology, literature or European Studies. It will also be of great interest to anyone living in, or concerned with, Europe today. William Outhwaite is Professor of Sociology at the University of Sussex.His previous publications include Habermas: A Critical Introduction, New Philosophies of Social Science, Understanding Social Life, second edition, 1986, and The Future of Society. He is co-author of Social Theory and Postcommunism, editor of The Habermas Reader, and co-editor of The Sociology of Politics. "How refreshing to encounter a book which not only seeks to understand the social transformations of Europe but also attends to matters of the European economy and the European state. This is a sociology book which ‘ticks all the right boxes' for students of political science, and, at the same time, advances a particularly sociological approach to the study of Europe ... 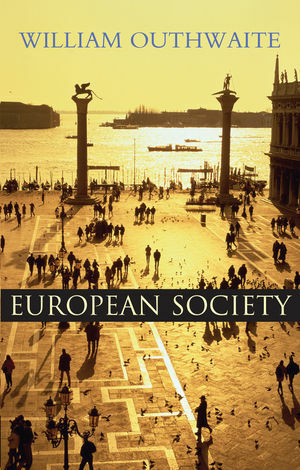 It should become essential reading, not only for sociology students and those following European Studies courses, but also for a range of scholars from disciplines that have hitherto viewed 'European society' as alien territory." "By drawing on a wide range of empirical and theoretical studies, Outhwaite has written a readable and accessible book on contemporary European society." "An insightful study of the emerging shape of Europe. Outhwaite skillfully demonstrates the significance of a European as opposed to a national level of analysis. A lot of ground is covered in this excellent short book."